Here is a savory version of the free-form fruit tart known in France as a galette. If Gruyère is unavailable, substitute Italian fontina or any good melting cheese. Be sure to use red or fingerling potatoes, as they hold their shape much better than baking potatoes, like russet, whose interiors turn to mush when cooked. Though rustic and casual, it is an instant party food when dressed up with crème fraîche and golden caviar. 1 Advance Preparation: Roll the prepared dough into a 13-inch round, transfer to a parchment- or silicone-lined baking sheet, and chill for 1 hour. Preheat oven to 400°F and position an oven rack in the lower third. 2 Make the filling: Heat the sauté pan over a medium-high flame. Add the olive oil and when it is hot, add the onion slices to the pan. Cook, stirring occasionally, until the onion is soft and lightly colored, 8 to 10 minutes. Stir in the salt, pepper, and chopped thyme or rosemary and blend well. Scrape onto a plate and set aside to cool. Wash the potatoes and pat dry, but don’t peel them. Cut into 1/4-inch-thick slices. 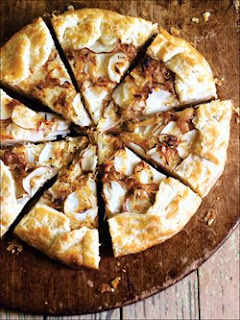 3 Assemble the galette: Mix together the cooled onion mixture, grated cheese, and potato slices. Spread the mixture over the prepared pie dough, leaving a 1 1/2-inch border around the edges. Drizzle with the remaining olive oil and sprinkle lightly with salt and pepper. Fold just the border of the dough up around the filling, pleating it to make a pretty, circular enclosure, leaving the center open. In a small bowl, beat the egg with a fork. Lightly brush the pleated dough with the egg to give it shine and help it brown in the oven. 4 Bake the galette for 45 to 50 minutes, or until the pastry is golden brown and the potatoes are soft when tested with a paring knife or skewer. Check the bottom of the galette for doneness by lifting slightly with a metal spatula. Transfer to a rack to cool for 5 to 10 minutes. 5 Transfer the galette to a serving plate with a cake lifter or two spatulas, or the bottom of a tart pan slipped underneath to keep it from breaking as you move it. Slice and serve warm.